BMW Group verkoop steeg met 2,8% in maart. BMW Group wereldwijd nummer één in het premium segment in het eerste kwartaal. +++ BMW levert 221.631 voertuigen in maart, stijging van 3,7% +++ Alle grote verkoopsregio’s dragen bij aan de stijgende verkoop +++ Groei in het eerste kwartaal voor BMW, Rolls-Royce en BMW Motorrad +++ BMW i3 verkoop steeg met 16% voor een beste eerste kwartaal ooit: 9.227 voertuigen verkocht. +++ Nota: “Onze focus blijft op duurzame, winstgevende groei. Munich. March 2019 was the best-ever single sales month in the BMW Group’s history with a total of 263,319 premium BMW, MINI and Rolls-Royce vehicles delivered to customers, an increase of 2.8% on the same month last year. Across the first quarter of the year, the company maintained sales at last year’s high level, with a total of 605,333 (+0.1%) vehicles sold. Sales of BMW brand vehicles increased 3.7% in March, with a total of 221,631 delivered to customers worldwide in the month. That result brings the sales total for the first quarter of the year to 519,307 / +0.4%. As availability of the new BMW 3 Series sedan ramps up, sales of the company’s best-ever selling car increased by 10.8% in March, with a total of 30,204 sold around the world. Growth was also driven by the BMW X family of vehicles, with customer demand increasing month by month – the X2, X3 and X4 are especially strong performers, with double-digit increases in deliveries. The BMW Group’s broad range of electrified vehicles continues to prove extremely popular with customers. Demand for the BMW i3 keeps on growing, with sales in the first quarter up 16.2% (9,227). This makes it by far the most successful first quarter ever for the innovative electric car, which was launched in 2013. The company’s plug-in hybrids are also in high demand – more than a quarter of all BMW 2 Series Active Tourer delivered to customers are electrified, while close to 20% of all MINI Countryman sold have a plug-in hybrid drivetrain. 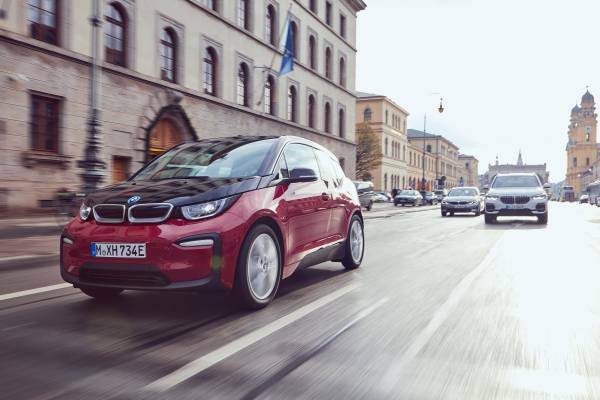 Meanwhile in Norway, one of the world’s leading markets for electrified vehicles, pure electric and plug-in hybrid vehicles account for around three-quarters of total BMW and MINI sales. By the end of next year, the BMW Group will have introduced ten new or updated electrified models. By 2025, the company plans to have at least 25 electrified models on the market, 12 of which will be fully electric. MINI brand sales were slightly lower in March than the same month last year, with 41,175 (-2.3%) delivered in the month. Year to date, 84,820 (-1.8%) MINI brand vehicles have been delivered to customers around the world. Next week’s Shanghai Auto Show will see the world premiere of the updated MINI Clubman, while preparations continue for the launch of the all new fully-electric MINI later this year. Meanwhile at Rolls-Royce, after 2018 set a new record in the marque’s 115-year history, sales growth continued into the first quarter of 2019. A total of 1,206 Rolls-Royce motor cars were delivered to customers across the globe (+49.4%) with growth being seen in every region worldwide. This was driven by sustained demand for all model families, with Phantom remaining a major growth driver. Exceptional customer demand for Cullinan has resulted in a strong order book, filled well into the fourth quarter of this year. BMW Motorrad has also achieved a strong start to the year with first quarter sales up 7.7% (38,606). In March, a total of 18,931 (+9.9%) premium BMW Motorrad motorcycles and maxi scooters were delivered to customers around the world. Despite headwinds experienced by the automotive industry in several major markets, the BMW Group achieved sales growth in all three major sales regions in March. The company bucked the trend in several very significant markets with BMW brand sales in the USA and China, for example, increasing 2.9% and 13.1% respectively compared with the same month last year. The BMW brand leads the premium segment in the USA in the year to date and the Chinese joint venture BBA saw strong sales in the first quarter. Despite the ongoing competitive global market environment and some other headwinds, we do expect to see increasing momentum in terms of volume and mix as the year progresses. The company continues to follow its strategy of prioritising profitability before volume.